Tourism is an important and growing economic sector for East Africa. 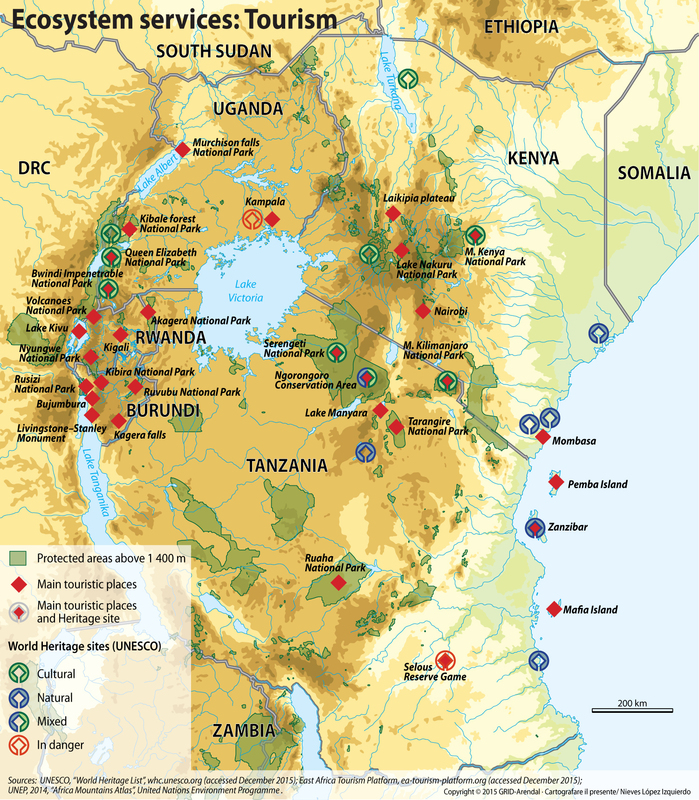 Economic revenues from tourism for Kenya, Uganda, Ethiopia, Rwanda, Uganda, DRC and Tanzania amount to an annual average of over USD 7 billion (World Bank, 2015). Mountains and mountain ecosystems are popular destinations for trekkers, mountain climbers, and for experiencing wildlife and spectacular scenery. As an example, tourists visiting Mount Kilimanjaro contribute over a third of Tanzania’s total revenues from tourism (UNEP, 2014). In areas where there are few alternative livelihood opportunities besides agriculture, tourism can bring in the much needed income through selling home-made products, guiding tours, and providing pottering services or employment in hotels and lodges (Alweny and Gatarabirwa, 2014; Debarbieux et al., 2014; UNEP, 2014). In recent years, there has been a growing interest in developing ecotourism in mountainous areas in Africa (Alweny and Gatarabirwa, 2014).